Today is Shrove Sunday, which of course means split pea soup and Shrove Buns. 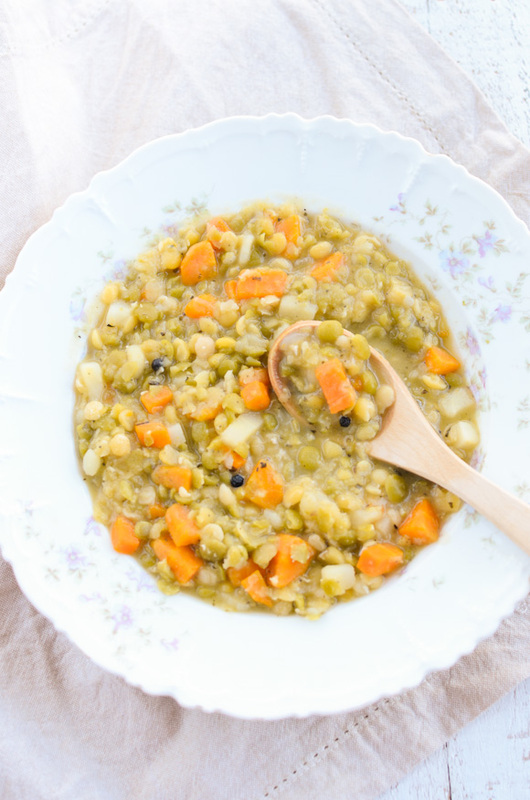 I will give those buns a miss this year, but split pea soup is definitely on the menu and this vegan version is an old favourite of mine. Although we are still in the midst of summer here in Sydney, I have no issues eating a big bowl of soup, the thicker the better. You can easily adapt this recipe to your liking, try using different vegetables like celeriac, celery and garlic or experiment with different dried herbs and spices. If you want to make it extra-fancy, add a drop or two of liquid smoke in the mix too. * I tend to keep ground mustard at home because it has a longer shelf-life than ready-made mustard. If you prefer, you can use a small dollop of normal mustard (wholegrain or Dijon) to season each portion at serving. 1. 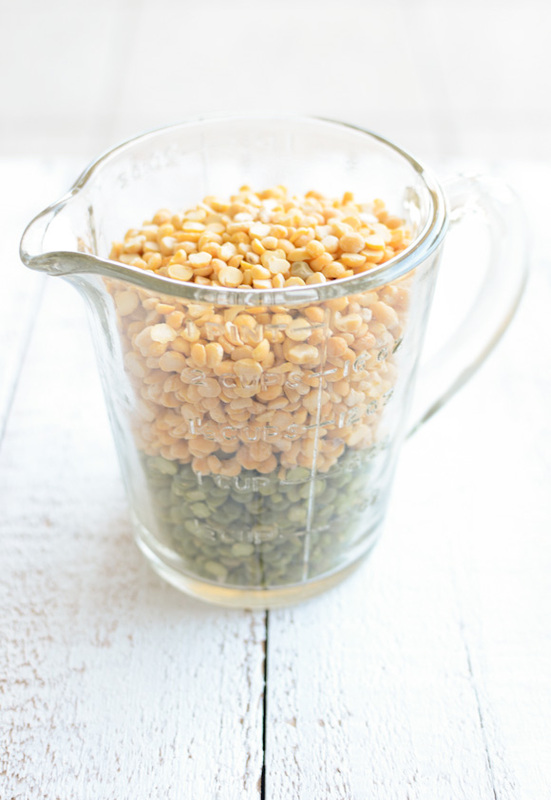 Rinse the split peas and remove any stones or discoloured peas. 2. Place all other ingredients, except for salt in a large French casserole. Bring to boil and leave to simmer for 40-60 minutes, depending on how mushy you like it to be. Season with salt and serve. You can freeze the excess soup. Split pea soup used to be my favourite. And yeah I like my soups thick, too! P.S Loving your bottom photo. At least now I can be glad it's winter in the northern hemisphere...I can let this soup help warm me up! What a lovely thick variation on the theme! Estonians unfortunately do not add quite a few of the herbs nor mustard, so am truly looking forward to trying this bowl of goodness! And Shrove buns have been a 'no-no' for me for a long time :) ! I'm a big split pea soup fan too! It was one of the first things I made when I started cooking actually! I'm not much into soup but that looks so delicious and comforting. I love split pea soup and yours looks perfectly warm and comforting, Maria. Wonderful recipe. Thank you for sharing! I adore split pea soup - and I always forget how much I love it. I need to make a big batch of this for lunches! I love the mustard in this recipe. Love split pea soup! Haven't made it in forever but that will change now. And I love the light in the photo, Maria! Wow I read the comments and they were not very helpful. Everyone talked about everything but making this receipe. Don't know if its difficult to make or if the receipe made great soup. Guess i'll have to make it and leave an opinion on this receipe. Oh well stay tuned for follow up comments.